497872. CELTIC. ‘Ring Money’. Circa 1150-750 BC. AV Penannular Ring (17mm, 11.68 g). 504902. ANGLO-SAXON, Kings of East Anglia. Beonna. Circa 749-760/5. AR Sceatt (15mm, 1.04 g, 4h). Mint in northern East Anglia (Thetford? ); Efe, moneyer. Struck circa 757-760/5. 505086. ANGLO-SAXON, Kings of All England. Edward the Confessor. 1042-1066. AR Penny (19mm, 1.34 g, 5h). Pointed Helmet type (BMC vii, Hild. F). York mint; Styrkollr, moneyer. Struck 1053-1056. 505087. ANGLO-SAXON, Kings of All England. Edward the Confessor. 1042-1066. AR Penny (19mm, 1.31 g, 10h). Hammer Cross type (BMC xi, Hild. G). Lewes mint; Osweald, moneyer. 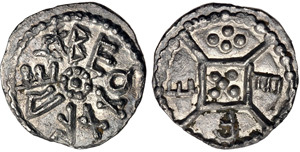 Struck circa 1059-1062. 498871. NORMAN. William I 'the Conqueror'. 1066-1087. AR Penny (19.5mm, 1.42 g, 8h). Profile/Cross Fleurée type (BMC i). London mint; Eadwine, moneyer. Struck 1066-1068. 498863. LANCASTER. Henry VI. First reign, 1422-1461. AR Groat (27mm, 3.75 g, 10h). Rosette-mascle/Pinecone-mascle mule. Calais mint; im: cross patonce (IIIa)/plain cross (V).. Struck 1431. 503722. YORK. Edward IV. First reign, 1461-1470. AR Groat (27mm, 2.91 g, 5h). Light coinage, Group Va, struck from Heavy coinage, Group IV, dies. 505089. YORK. Edward IV. First reign, 1461-1470. AR Groat (28mm, 3.29 g, 9h). Heavy coinage, Group III. London (Tower) mint; im: rose. Struck 1464-1465. 505090. YORK. Edward IV. First reign, 1461-1470. AR Groat (26mm, 3.12 g, 8h). Light coinage, type Vd. London (Tower) mint; im: rose. Struck 1464-1465. 505092. YORK. Edward IV. First reign, 1461-1470. AR Groat (26mm, 2.95 g, 4h). Light coinage, type VI. London (Tower) mint; im: sun. Struck 1465-1466. 505093. YORK. Edward IV. First reign, 1461-1470. AR Groat (26mm, 2.95 g, 8h). Light coinage, type VIII. London (Tower) mint; im: crown/sun. Struck 1467-1468. 505088. YORK. Edward IV. First reign, 1461-1470. AR Groat (26mm, 2.95 g, 8h). Light coinage, type Xa/VI mule. London (Tower) mint; im: long cross fitchée/sun. Struck 1469-1470. 506133. TUDOR. Henry VII. 1485-1509. AV Angelet – Half-angel (20mm, 2.57 g, 5h). Class IV. London mint; im: rose. Struck 1487-1488. 505094. TUDOR. Henry VII. 1485-1509. AR Groat (26mm, 3.17 g, 9h). Class IIIC. London (Tower) mint; im: anchor. Struck 1499-1502. 505097. TUDOR. Henry VII. 1485-1509. AR Groat (27mm, 2.98 g, 6h). Regular profile issue. Tower mint; im: cross crosslet over lis/cross crosslet. Struck 1504-1505. 505110. TUDOR. Edward VI. 1547-1553. AR Shilling (33.5mm, 6.31 g, 3h). Third period; Fine Silver issue. Tower (London mint); im: У. Struck 1551-1553. 505113. TUDOR. Edward VI. 1547-1553. AR Shilling (33mm, 6.07 g, 3h). Third period; Fine Silver issue. Tower (London mint); im: У. Struck 1551-1553. 496240. TUDOR. Elizabeth I. 1558-1603. AR Groat (23mm, 1.90 g, 5h). Second issue. Tower (London) mint; im: cross-crosslet. Struck 1560-1561. 505122. STUART. James I. 1603-1625. AR Shilling (31mm, 6.05 g, 8h). Second coinage. Tower mint; im: rose. Struck 1605-1606. 505125. STUART. James I. 1603-1625. AR Shilling (32mm, 5.89 g, 11h). Third coinage. Tower mint; im: lis. Struck 1623-1624.